We have some special PRIZES hidden along the hop! Three new release stamp prize packs will be given away to some lucky hoppers, so make sure you comment on all the blogs for your chance to win! Karen has also put together some special Bundle Deals including the popular “I want it all” YNS Bundle so make sure you check those out! 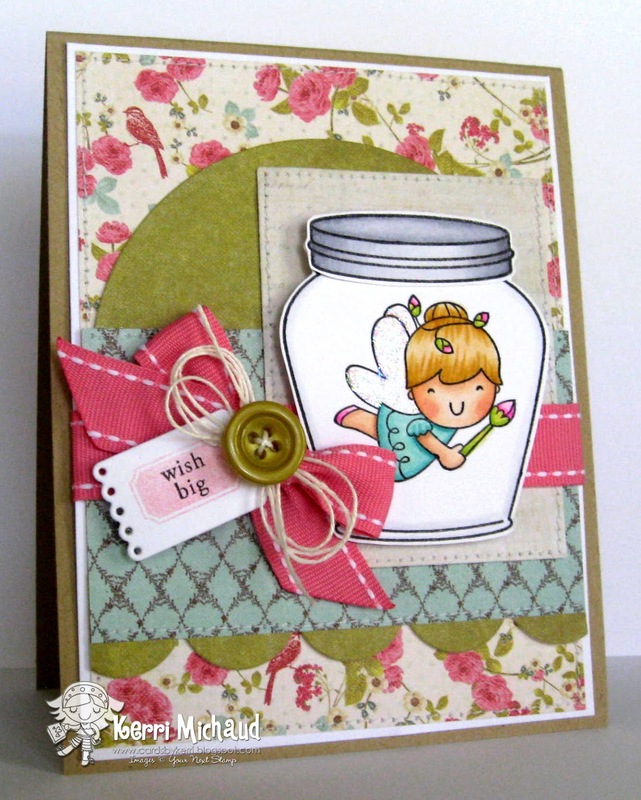 I used the new Jam Jar and stamped this adorable fairy from the new Seasonal Fairies stamp set inside. I just think the jars are so fun, and this fairy~CA-UTE!!! The dp is Prima Madeline. Now it’s time to hop on over to Angela's amazing blog! Thank you so much for stopping by and happy hopping! Just GORGEOUS, Kerri....love the layout design, your coloring and the colors!! I already know I have these fairies coming my way, now to find that DP... LOL What a SUPER Pretty Card Kerri!!!! I agree, cute, cute cute!!! Great papers and what a fab bow. Now this is one beautiful card. I LOVE the jar with the fairy. Makes me smile. The colors you used are so beautiful. Thanks for sharing. This is such a sweet card. I love the fairy. She goes so well with the papers! TFS. Another cute fairy that I must have! I love how you place her in a jar to glow! Thank you for showing us the new stamps! Fun card ~ I really like the combo of pink & green. 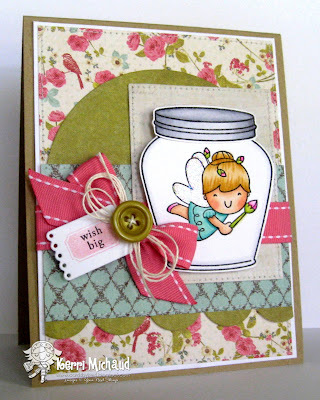 That fairy is so cute...love how you used the jar image too! this is so sweet! i love the dp and the colour combo! So, so, sweet! Your coloring is wonderful and the papers and stitching are great! I have to second all of the above regarding the colors and paper. They're fantastic! sweet card love the dp. your fairy is adorable! love the rosebuds. Beautiful card!! I am loving the fairies! They are so cute! Great card Kerri, so cute and wonderful! Very cute--I like the layout and the papers and colors you used. Beautiful card, Kerri! I love this jar, too! Great layout! What a perfect card for a little girl! This is just adorable and love the papers you used! Very, very cute! Love the colors!